This is why we call these 'Artisan-Grown' edible nopal cactus pads. Just before we start the larger commercial harvests we cut the grasses growing around the plants over the winter. The grasses from the rows are cut and laid in among the cactus plants in order to shade the soil. The grasses from the pathways are also cut and placed gently around the cactus. 1. Removal of the grasses will open the plants to the warming affects of the sun. This will stimulate the summer growth and formation of new cladodes (cactus pads, edible cactus leaves, nopales). 2. The cut grasses will help shade the soil, reducing temperature spikes and helping keep the cactus roots cool and conserving moisture. If the roots don't cook, the plant can take more sunshine and heat and grow faster. 3. As the year goes on the leaves and the straw from the grass stems will slowly decompose into the soil, adding to the biosphere of the soil zone. Cutting by hand is more challenging. A mechanical string trimmer is faster, but the grasses are chopped up and fly everywhere, including damaging the growing cactus. And this cactus is worth growing for our customers. And I will grow it right, and leave this soil richer and deeper than when I got here. Esta es la razón por la que los llamamos "Artisan-Grown'. Justo antes de empezar las grandes cosechas comerciales cortamos las hierbas que crecen alrededor de las plantas durante el invierno. Los pastos de las filas se cortan y se sentó entre los cactos en orden a la sombra de la tierra. Las hierbas de los caminos se cortan y coloca suavemente alrededor de los cactus. 1. Extracción de las gramíneas se abrirá las plantas afecta al calentamiento del sol. Esto estimulará el crecimiento de verano y formación de nuevos cladodios (pastillas de cactus comestibles, hojas de cactus, nopales). 2. Cortar la hierba ayudará a la sombra del suelo, reduciendo los picos de temperatura y ayudando a mantener las raíces de cactus fresco. Si las raíces no cocine, la planta puede tomar más sol y calor y crecer más rápido. 3. Como el año pasa sobre las hojas y la paja de los tallos de pasto se descomponen lentamente en el suelo, agregando a la biosfera, de la zona de la tierra. Cortar a mano es más desafiante. Un recortador de cadena mecánico es más rápido, pero las gramíneas están picados y volar por doquier, incluso dañar el cultivo de nopal Si vale la pena hacer, vale la pena hacer lo correcto. Y esto vale de nopal creciente para nuestros clientes. Y voy a crecer bien, y dejar esta tierra más rico y más profundo que cuando llegué aquí. I was picking and packing nopal cactus today and had the urge to take pictures of the nopales pads. We have here Grade-D (juicing Grade) cactus and Grade -C Gourmet grade nopal cactus pads in these pics. This is the quality we've got being harvested right now. Yo estaba recogiendo y embalaje nopal cactus hoy y tenía ganas de tomar fotos de los nopales pastillas. Aquí tenemos la categoría D (zumo de grado) y cactus -C GRADO grado Gourmet nopal cactus pads en estas fotos. Esta es la calidad que tenemos está cosechando ahora. Above we have Grade-C nopales cactus. This is the grade we recommend for most culinary uses. This is an easy-to prepare nopal cactus that needs just a wiping under running water to clean off. They are excellent raw in salsa or a cool refreshing cactus salad. They can also be mixed with other foods as another ingredient in a healthy diet. Add some nopalitos diced-fine to your meatloaf and see how much moister the loaf is. Fry nopales in with other vegetables in a stir fry. Fry some potatoes and scramble eggs in, as the eggs are almost done toss your chopped cactus in, stir and spoon them into tortillas to make breakfast burritos. Arriba tenemos la categoría C cactus nopales. Este es el grado que recomendamos para la mayoría de los usos culinarios. Esta es una forma fácil de preparar nopal cactus que sólo necesita un barrido bajo un chorro de agua para limpiar. Son excelentes materias en salsa o un cactus refrescantes ensaladas. También pueden ser mezcladas con otros alimentos como otro ingrediente en una dieta saludable. Agregar unos trocitos finos de nopalitos a su pastel de carne y ver cuánto más mojado el pan. Freir nopales con otras verduras en un salteado. Freír las patatas y los huevos revueltos, como los huevos son casi hecho balancearse en sus cactus en picado, agitar y cuchara de ellos en las tortillas, burritos de desayuno. This photo shows the Grade D 'Juicing Grade' nopalea cactus we're harvesting right now. The quality and looks changes through the year, it is a plant that grows outdoors after all. These Grade-D Juicing-grade cactus are thicker skinned with more weight per nopal pad. These are the leaves that grew over the winter. They've seen a few storms, but they are full of life. This is the grade people who are going to juice them might want to use. They have a lot more fiber than the younger leaves. Esta foto muestra el grado D 'exprimir' cactus nopalea grado estamos cosechando ahora. La calidad y analiza los cambios a través del año, es una planta que crece en el exterior después de todo. Estos Grado D exprimir cactus grado son más gruesas de piel con más peso por nopal pad. Estas son las hojas que crecieron durante el invierno. Ellos han visto pocas tormentas, pero están llenos de vida. Esta es la clase de personas que van a ellos el jugo que desee utilizar. Tienen mucha más fibra que las hojas más jóvenes. While not strictly vegetarians (not even loosely vegetarians, in fact), we’re always looking for ways to extend Meatless Mondays well into the week. Vegetarian tacos are usually a pretty easy way to do that, though for us, that generally means tofu or fish. In fact, cactus might not have occurred to if not for Jason Wyrick‘s entirely enticing dish in Vegan Tacos. 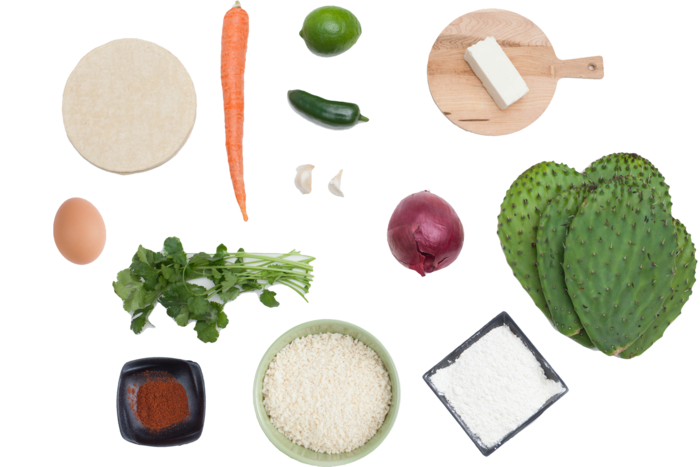 We’re always looking for a reason to go to our favorite Mexican market, and the hunt for nopales is just the one we’ve been waiting for. Between this dish and the Wyrick’s many other variations on the vegan-taco theme, our Meatless Mondays (and Tuesdays, and Wednesdays…) are looking a lot more interesting. The rain did the nopal cactus and the grasses real good! The grass is rich and deep green, full of nutrients and holding the soil together. Many of the grasses are a meter tall and more. Right now the grasses are shading the cactus and delaying awakening from the winter dormancy. In the coming weeks the seeds on the grasses will ripen and we'll cut the grass and use the stems as mulch to shade the soil. Once the nopal plants are opened to the warm sun they will take off well and continue growing through the summer. We expect to be on a roll by Cinco de Mayo. La lluvia hizo el nopal cactus y las gramíneas bien real! La hierba es rica y el verde oscuro, lleno de nutrientes y manteniendo el suelo juntos. Muchas de las gramíneas son de un metro de altura y más. Ahora el sombreado de las gramíneas son cactus y retrasar el despertar de la dormancia invernal. En las próximas semanas las semillas de las gramíneas madure y vamos a cortar el pasto y el uso de los tallos como mantillo a la sombra de la tierra. Una vez que las plantas de nopal se abrió al calor del sol que saldrá bien y seguir creciendo durante el verano. Esperamos estar en un rodillo por el Cinco de Mayo. 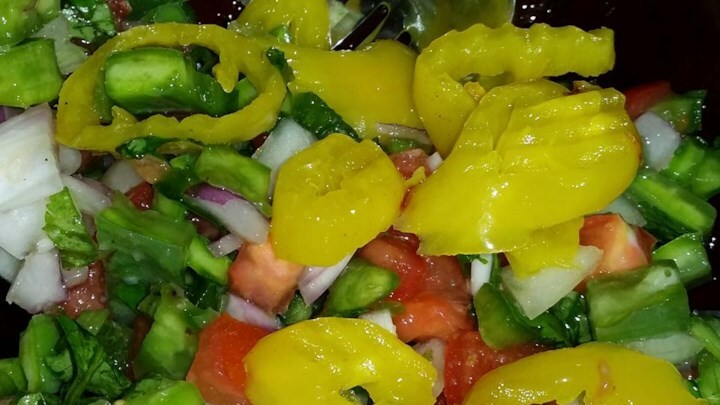 "A delicious spicy salad, made from tender cactus, tomatoes, onions, jalapenos, cilantro, and lemons. This is hot and spicy, so beware!" 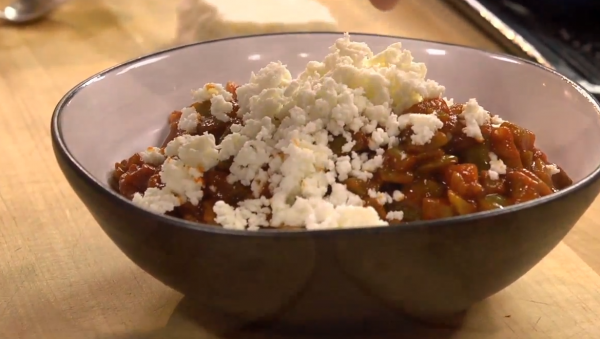 Read the entire Southwestern Cactus Salad recipe! This is an easy way to enjoy fresh nopal cactus. Fry some potatoes up whatever way you like. diced, sliced.... add some onions too. When the potatoes are almost done add some cactus and stir it with the nearly cooked ingredients. Give it a couple of minutes. Our cactus does not need a lot of cooking if you even cook it at all. There's no need to cook our cactus until it becomes dark in color, eat it fresh and alive and bright green! For another cactus treat you can add eggs to the 'water-cactus-onion mix and scramble them in. When the eggs are cooked spoon the mix into warm tortilla shells and have them as breakfast burritos. Vegan Kitchen tries to connect vegans with wholesome food. they liked the cactus. I enjoyed their show. It is homey and fun. A lady shows her use of powdered cactus, protein powder, frozen berries and fruit juice as a quick and easy way to add some fiber to her diet while taking advantage of the many benefits of the Natural Healing Cactus. Our cactus can be used in place of the powder and some of the juice.